Is Mel getting a divorce? Will he pay his wife to keep his secrets? What does the church think? Who Cares! Well, it is always a little said to see a long marriage dissolve. No matter how much of a wacko he's acted like in recent years, I was always impressed by his long term marriage. Kinda like Paul Newman. Details I don't care about. But like I said, it's always sad when people lose decades they've dedicated to each other. A divorce?!? I totally didn't see that coming. Now, if the news was that Mel Gibson's wife had died a horrifying death at the hands of vicious thugs, provoking Gibson into a vengeful rage leading to a spree of violent retaliation against those who destroyed the peaceful life he once knew as a calm, thoughtful man struggling to do the right thing in a chaotic and confused world in transition (be it post-apocalyptic, historic, or merely L.A.)--that I would have seen coming from miles away. But a divorce? Yeah, that I'm going to have to try to get my head around. Did not see it coming. 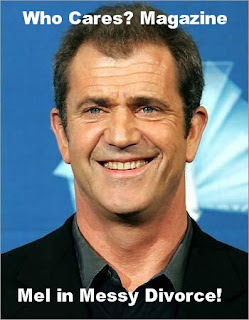 Mel Gibson getting a divorce? I wonder if like so some many other right wing religious whackos, he has be messing around with "the gay"? Or maybe just messing around. Well, I saw it on the cover of the National Enquirer when I was paying for my groceries this morning, so it must be true. I didn't care enough to see it coming or not see it coming. He's annoyed me for years, so I kinda hope his wife takes him for all he's got.